There are a lot of scopes on the market, giving hunters and marksmen plenty of options to choose from. There are even many scopes designed specifically for rifles that fire a .223 caliber bullet. 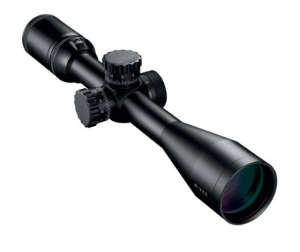 The Nikon M-223 3-12x42SF is an excellent option in that category of scopes. The Nikon M-223 features the BDC 600 Reticle, which was specifically designed to military grade specifications to help you accurately calculate the trajectory of 5.56 NATO rounds with the polymer tips. For newcomers and beginners to using a scope, a reticle is the unique indicator that calculates the trajectory of a potential shot. Originally known as “cross hairs”, modern reticles like the BDC 600 are customized to particular rounds. When the M-223 has been properly “zeroed”, the BDC 600 reticle features an open circle, with hash marks to walk out the trajectory from 100 to 600 yards. Knowing that my scope is perfectly engineered for my bullet, it’s no problem at all to accurately drop a target two football fields away. A scope with the most powerful lens in the world is no good if you can’t see through it properly. I love the M-223 with its four inches of non-critical eye relief, which gives me an amazingly clear sight without risking recoil damage to my face. The ocular lens on the M-223 is huge, which gives me a super bright high-resolution view. I also like the four-time zoom range, which helps me quickly identify targets in the field. Nikon’s patented Ultra ClearCoat optical system means that the lens is transmitting as much as 95% of the light through the body tubes. That’s simply astounding, as it means that I get a bright, sharp and fantastically crisp image. Some beginners forget that one of the most important ways to calibrate your rifle scope is to accurately set the parallax. By using light refraction, the parallax of your intended target comes into sharp focus, giving you vital information for landing a difficult shot. I don’t buy scopes just to make my rifles look pretty. I admire the M-223 for its rugged one-piece main body tubes. Excellently engineered, I know I can rely on the scope to handle rough abuse in the field. Properly mounted, the scope is shockproof. The M-223 is also nitrogen-filled and O-ring sealed, which means it can handle any boggy, wet conditions you can throw at it. You might be freezing in the mud, but at least you can rely on your scope to give you a crisp, clear shot with no fogging.